Young and tough (or so we thought) at first we tried carrying quarters over our shoulders. That didn’t last long. They weighed a ton and the country was steep and covered with a bazillion little rolling rocks, limbs, blowdowns and other “gotcha’s” that went out of their way to trip us. We finally scrounged up a couple of army surplus pack frames and lashed quarters to them, which made the hike tolerable. Did I mention we were so naïve that one morning as we came back to the meat pile, we shot a very large black bear that was dining on a gut pile? That added another hundred-pound load. That hunt helped turn me into a serious backcountry hunter — and a serious student of backcountry meat care and packing. Over the years some innovative hunters and technology have given us tools and methods that greatly assist in this endeavor. You can put some of these methods to good use even on local whitetail hunts where you can’t get a rig right to the animal and don’t want to drag the carcass. Here, in no particular order, are 10 of the best ways to pack out game meat without breaking your back. 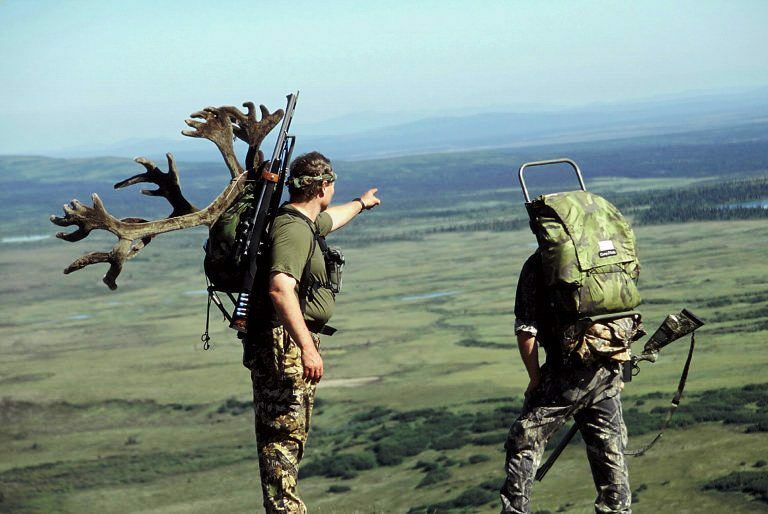 When all else fails, bone the meat out and backpack it using a sturdy frame pack. While I have friends who swear by their fancy new space-age internal-frame packs, in my mind nothing beats a tough external frame pack for carry heavy loads. I also like to load my meat into thick 3mm plastic garbage bags, which keeps the blood off my pack bag. If it’s a multi-day trip out, I take the meat out at night so it can cool down. I didn’t catch on to little kiddie sleds until I moved to the snow country of Alaska, where we used them to haul bear baits and camp supplies in over snow drifts, and moose and caribou quarters out over the tundra. You can even pull them behind a snow machine or ATV, if you’re careful. Pretty slick. Another new one for me, I first used one of these this past spring hunting black bears in British Columbia. These bikes allow you to quickly access backcountry areas that have dirt roads blocked off to motor vehicle access. Hunt with the bike only, and when you get something, go back and get the trailer, which can haul maybe 150 lbs. of meat maximum, depending on terrain and weather. One note: A loaded trailer will eat the bike’s electric battery, so having a fully-charged spare is money. I make no bones about it — though I have hunted on them a lot, I am not a fan of horses. They’re cantankerous, they’ll kick you and bite you and run away from you, and they require daily feeding and pampering. That said, nothing packs out a big load of meat like a sturdy pack horse. In much of the Rocky Mountain West you can hire a packer to get your meat out for you for a few hundred dollars, which in my mind is cash well spent. If that’s part of my plan, I make sure I contact a packer before my hunt so he knows I might be calling later and we’ve already agreed on price. Option two: Llamas, which are much more user friendly but can only carry maybe half as much as a pack horse, if that. One- and two-wheeled game carts have become something of the rage in many areas, for good reason. The best feature a motorcycle tire, brake and solid steel frame. You need a wide trail or dirt road to use them, but they are so tough they can pretty much handle all the weight you can pile on them. The largest are designed for two people. A pack wheel is sort of a wheelbarrow with pack bags. In fact, the Pack Wheel is made of 6061 aluminum and features a 29-inch mountain bike tire with a disc brake. It also breaks down for easy transport. This thing can carry a lot, but it has to be packed and lashed properly. It can carry 150 lbs. or more, depending on the terrain — and of course, how tough you are, Batman. Naturally an ATV is the cat’s meow when it comes to packing meat, if it’s legal to do so and you can get your rig close enough to the critter. If I can get away with it my side-by-side with a dump bed is unbelievable for this. A standard four-wheeler is awesome, too — but make sure you don’t overload the rear rack or you’ll find yourself tipping over backwards while going up a steep grade. Have you ever shot an animal on a steep mountainside well below the road and wondered, now what? The answer is to use the truck’s winch and cable to drag the thing up the hill to the road. This is not a total no-brainer — be careful that the rope or cable doesn’t snap, which could seriously injure somebody — and it’s best if you have one person operating the winch, and another helping guide the carcass through the inevitable tangles. Remember that old TV show, “Who Wants To Be A Millionaire?” When a question stumped contestants, they were allowed to phone a friend for help. Well … nothing wrong with calling up some buddies to help pack meat. The downside to that is the hunter usually has to share some of the prime cuts and buy the beer, but when we’re talking an elk or moose, there’s plenty of both work and meat to go around. Oh yeah, been there done that! Many times on backcountry hunts, if it’s early in the hunt and I don’t want to leave just yet (or the Alaska bush plane isn’t due for a few days), it’s adios freeze-dried meals and hello, backstraps! Nothing better than packing choice cuts of meat out in your belly, and not on your back! If you’re in the backcountry and want to prevent the hair of your precious cape from slipping, try using Koola Buck Anti-Microbial Spray to keep this from happening. Epidermal slippage can occur before, during or after tanning and is caused by bacteria getting into the hair follicles. The follicles begin to decay, and the hair falls out of the hide. Properly preparing the hide in the field by spraying it with the Koola Buck Anti- Microbial Spray will help prevent this from happening. Surface pH at the time of harvest is neutral at 7.0, but as heat, dirt and other debris begin to contaminate the surface, the pH begins to rise. By applying the Koola Buck Anti-Microbial Spray on the cape, the pH level is significantly lowered, which also greatly lowers the growth of bacteria, thereby eliminating hair slippage. Simply put: avoid bacteria; avoid slippage. It also works well when sprayed on the meat itself. MSRP is $12.99 for a 10 oz. bottle. More information: www.koolabuck.com.